While on the flight to AASL in Columbus, OH, I read Steal Like an Artist: 10 Things Nobody Told You About Being Creative in its entirety. Like Show Your Work, which I read over the summer, Steal Like an Artist offers fantastic advice on being creative, promoting your work, sharing with others and following your passion. While Kleon’s target audience is artists and creatives, I think that there is so much in here that can apply to educators and our students. I could go on about this book forever, but instead I’ll focus on a few of my favorite chapters. I think that this lesson is something that a lot of educators already get. When it’s your first year, you want to create everything from scratch: your lesson plans, the posters on your wall, handouts you give to students, etc. After dealing with massive amounts of stress trying to do all that yourself, you realize that you don’t have to reinvent the wheel – that you can learn from others who’ve come before you and adapt things to work for you. Another important part of stealing like an artist is learning that inspiration can come anywhere. 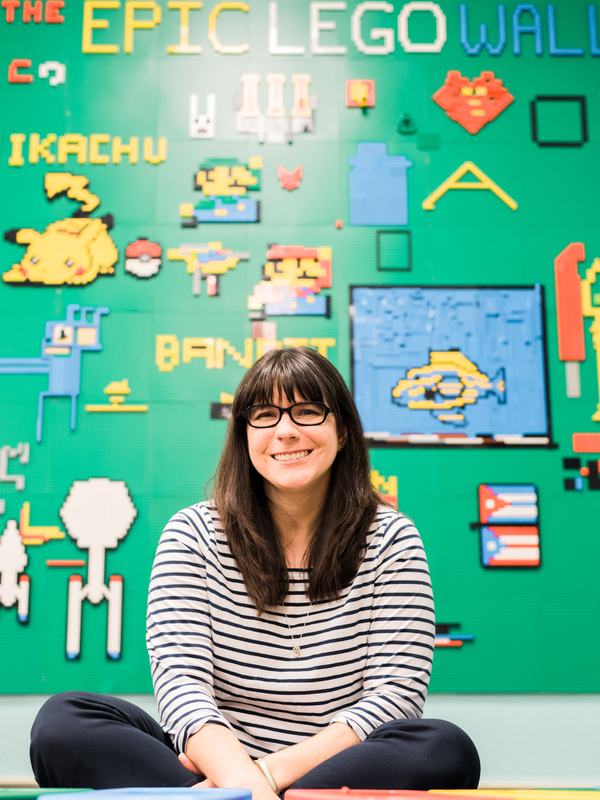 I first got the idea for our Epic LEGO Wall from a Pinterest post with an image of a LEGO wall in a child’s room. Exhibits I saw at the Columbus Museum of Art have inspired me to think more about how to incorporate art appreciation into our Makerspace. I’ve gotten tons of great ideas to improve our library programs from reading self-help and business books. Inspiration doesn’t always come in the obvious places, and you have to be ready for it when it hits. 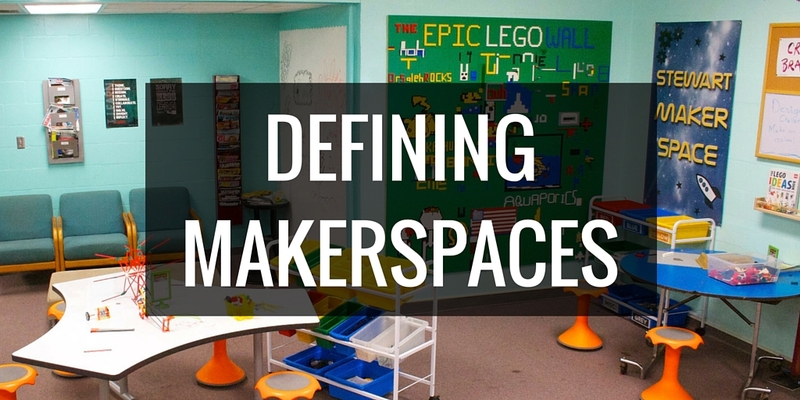 When I first started blogging about our makerspace in early 2014, I had no idea what it would become or where it would take me and my students. I didn’t know yet exactly who I was as an educator; in fact, I’m still figuring that out. But sharing about what I was doing, here on the blog, presenting at conferences, through Twitter chats, etc, all helped to shape the space and to shape who I’ve become. This ties in with what I was talking about a few weeks ago – we need to put ourselves out there, whether or not we feel like we’re ready for it. Because we’ll probably never truly feel ready, but that shouldn’t stop us. Of course I love this one 🙂 While I tend to do a lot of writing on my computer, I’ve come to learn that making time to get away from the screen is invaluable in getting new ideas. 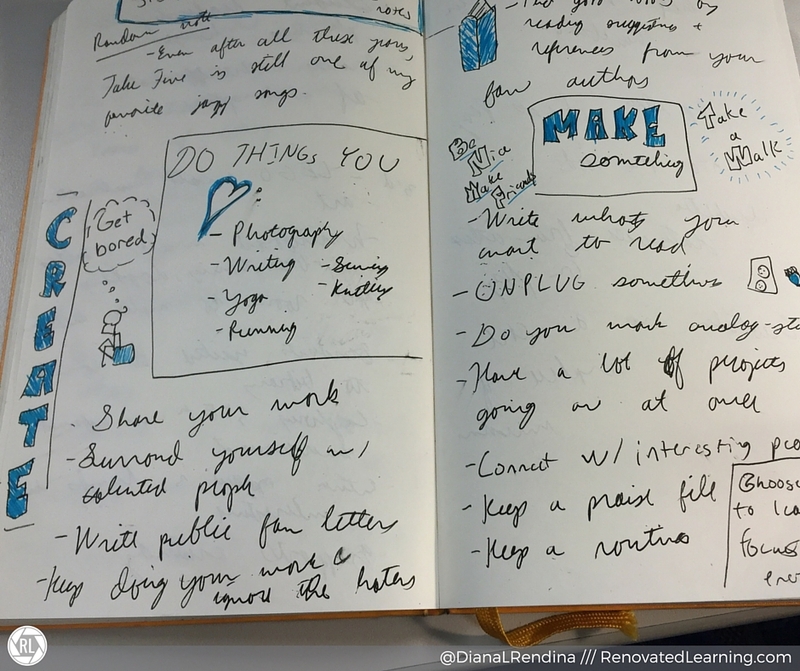 I write a lot in a Moleskine notebook – I’ll often write out drafts or outlines of posts before I actually start typing it up. I love how Kleon has two desks: a digital one with his computer, and an analog desk with tools, art supplies, paper, etc. I’ve been trying to recreate this in my home office and at my school – sometimes when I spend too much time in front of the screen, I start to zone out and my productivity drops. Even just a quick craft project or doodle can do wonders to get me back on track. This is one that I’ve often struggled with. I love what I do. I read middle grade and young adult novels in my free time for fun. I find books about learning space design, makerspaces and creativity fascinating. I enjoy visiting other schools, makerspaces, museums, etc. But still, I think it’s good for me to have interests that are purely just for me. Sometimes that might be binging on Doctor Who (preferably David Tennant episodes); othertimes, it’s knitting or sewing projects. Having these outside interests helps me to feel more balanced, and I think it makes me better at my work too. I’ve seen this one over and over again. Like when I started a makerspace with no budget and no dedicated space – I had to be creative in figuring out how to make it work, but those constraints freed me up. When I started writing grants, I was limited by the parameters of the grant guidelines, the funding amount, the vendors I could use. I think that these limitations made for better decisions, because I had to carefully consider what I wanted the space to be like and what would be best for my students. I think this worked better for us than if someone had just given us $10,000 up front with no restrictions. I’ve also seen limitations work wonders when creating design challenges for my students. If I leave a design challenge or prompt with my students too open ended (build something with xyz tool/material) often they quickly get bored and don’t push themselves too hard. But when I add in a little guidance or some limitations (make a working phone tripod using as few pieces of K’nex possible; create a collaborative city out of cardboard; design something that can fling something across the room) I see their creativity flourish and the projects that come out are amazing. No matter whether or not you view yourself as a creative, there’s much to be learned from Steal Like an Artist. I’ve fallen in love with Kleon’s work and I keep going back to it over and over again. Plus, it’s short enough to read on a flight. Win-win. 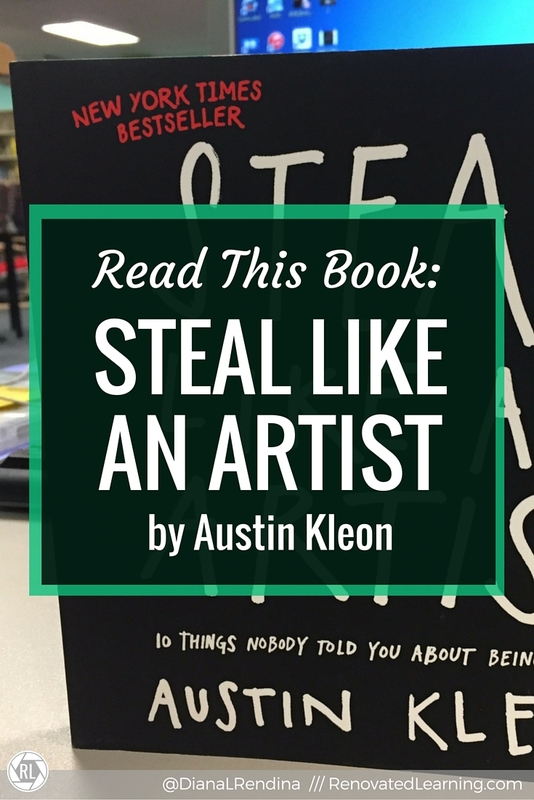 Have you read Steal Like an Artist or any of Kleon’s other work? What were your main takeaways? I have just finished this book myself! My favourite quote from it is – “Nothing is more paralyzing than the idea of limitless possibilities”. Your section on “Creativity is Subtraction” sums up my feelings about this perfectly. Thanks for the great post.